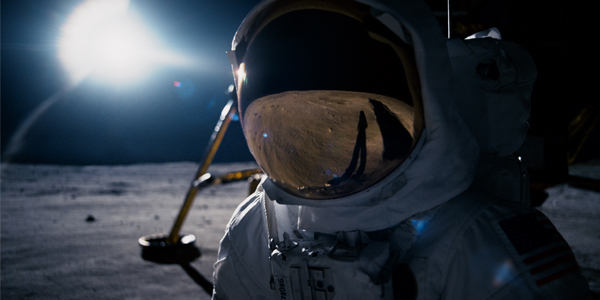 While Ryan Gosling’s Neil Armstrong remains a stoic figure throughout most of Damien Chazelle’s First Man, never seeming to fully process the death of his daughter as he enters the space program, he succeeds in having a big emotional moment shortly after he lands on the moon. It’s revealed in the film that he brought a bracelet belonging to his daughter in the shuttle with him, and he leaves it in a crater on the moon in her memory. I think it’s true, but no one knows for sure. We know that he brought… well, we know that he went off to a crater for 10 minutes and stood by himself, and didn’t tell anyone what he did, and no one knows what he did. It was off camera and whatnot. And he refused to disclose his flight manifest, which would say what he brought to the moon. And we also know that many astronauts in the lunar programs brought mementos of loved ones to leave – either dead loved ones are still living. With First Man both being a contender in this year’s awards race, and soon arriving on home video, I had the immense pleasure of sitting down with both Damien Chazelle and Claire Foy this past weekend to discuss their collaboration. The primary subject of the conversation was the emotional fortitude displayed by Neil Armstrong during the years the movie depicts, and it naturally led talking about the bracelet scene. While I admittedly was under the impression that it was fictionalized, the director offered up some interesting evidence suggesting that the bracelet scene could have happened as depicted. He freely admits that it’s not something that can ever really be verified, since Neil Armstrong never spoke about it before his death in 2012, but there are enough puzzle pieces — or, weirdly, lack thereof — to start putting together a picture. That’s where Jim Hansen, the biographer, got the idea. Did he go to the crater to leave something behind? And he talked with Neil’s sister, June, who said she didn’t know for sure, but she thought he did or she liked to think he did. So we did that, but in a way, I think it was not just the idea of that moment that I found beautiful, but also just the fact, of course, if it did happen, that he never talked about it. That’s just typical Neil. Going back to what I find sort of heartbreaking about him, that’s sort of the closest he could ever come to maybe finding some sort of catharsis. But even when sitting there in front of the person who would understand his loss more than anyone, his wife, who shares the loss, he still would be, like in the last scene of the film, unable to actually talk about it. First Man has been racking up significant award nominations in the past few weeks, and time will tell if/how many times it will be mentioned when the Academy Award categories are announced on Tuesday, January 22nd. For those of you who missed it in theaters, or really want to see it again, it’s currently available for DigitalHD purchase — and those of you who are all about physical editions will find 4K, Blu-ray and DVD copies available in stores also on January 22nd.